يشكل Travelodge Hotel Sydney Martin Place بموقعه الممتاز في المدينة نقطة انطلاق جيدة لاستكشاف أفضل ما فيها من معالم ومناطق نابضة بالحياة. يجذب هذا العقار ذو 4 نجوم، والذي يبعد 0.2 km فقط عن وسط المدينة و 12 km عن المطار، الكثير من الزوار سنوياً. يوجد العديد من المعالم السياحية الأكثر جذبًا للسياح في هذه المنطقة. يعمل Travelodge Hotel Sydney Martin Place على ضمان إقامة مريحة لضيوفه من خلال خدماته الممتازة وحسن ضيافته. يمكن الاستمتاع بمجموعة من الخدمات على أعلى المستويات في الفندق كمثل واي فاي مجاني في جميع الغرف, خدمة التنظيف يوميًا, مكتب الاستقبال على مدار الساعة, تخزين الأمتعة, واي فاي في المناطق العامة. في Travelodge Hotel Sydney Martin Place غرف نوم يزيد عددها عن 86 صممت بذوق وعناية لتوفر لك كل وسائل الراحة . بعضها يحتوي أيضاً على تلفزيون بشاشة مسطحة, غرف لغير المدخنين, مكيف هواء, مكتب, ميني بار. كما أن مجموعة الخدمات الواسعة الموجودة في الفندق لضمان راحتك تترك لك الكثير من الخيارات لقضاء وقتك أثناء فترة إقامتك. يشكل Travelodge Hotel Sydney Martin Place بخدماته الراقية وموقعه الممتاز، قاعدة مثالية للاستمتاع بإقامتك في المدينة. يُرجى من النزلاء إبلاغ الفندق مسبقًا بنوع السرير الذي يفضلونه. يمكن الإشارة إلى ذلك في مربع الطلبات الخاصة أثناء الحجز أو عن طريق الاتصال بالعقار مباشرة. بيانات الاتصال موجودة في تأكيد الحجز. يوجد موقف للسيارت خارج الفندق مقابل رسوم إضافية. على الضيوف القادمين بسياراتهم التواصل مع العقار مسبقاً. Great stay for a long mardigras weekend. Great location close to Hyde Park in CBD. Comfortable room, comfortable bed. Friendly staff. This hotel will definitely be one of my options for my next stay in Sydney. We stayed in a standard queen room. It was impeccably clean, a decent size, and very well appointed. The location was only a 5 minute Uber from a wedding we needed to attend. Mardi Gras happened to be on the same weekend but can safely say no noise was heard from our room, we were able to have a relaxing sleep. Although checkout was 11am they allowed us to keep our bags there and use bathroom facilities to get ready for our event. Staff were very friendly and accommodating. Pricing is to be expected for Sydney and I found it reasonable. If you’re looking for somewhere convenient, well priced and close to the city, this is the place for you. While the rooms are small, the location is excellent and for the price, it's definitely worth it here if you're not planning to stay inside your hotel for too long. Very clean, basic amenities. I liked that the staff there allowed us to check in early, especially since we arrived at 8am. Aircon totally ineffective, seriously. Remote control ran out of battery had to unplug TV to turn off. Was so tired that couldn't be bothered calling reception and waiting for maintenance. These elementary things should be routinely checked. When I back to my room after a day of work I found that my room door was left opened without locked!!! Luckily my personal belongings are still there but obviously it was the cleaning lady who didn’t close the door properly after she made the room! When I called the reception to complain he just told me to tell the front desk again on the next morning as it’s 11pm at night already!!! I told him I feel very insecure and what if some guests walked pass and found my door not closed at all and got in and stole all my stuff? He just repeated that I could tell the staff the next morning and didn’t comfort me or give any reason or guarantee that won’t happen again! What an answer!!! I’d strongly suggest you NOT to choose this hotel. Except for the location which is close to where I work, I don’t find this place safe, clean or comfortable to stay in!!!!! Not to mention about the poor security here, they didn’t refill milk and coffee and there’s no bottled water. Even when I told the reception, the staff would just ask u to tell the front desk in the morning again. Is the night shift staff not getting paid or what? Totally unbearable and unacceptable! 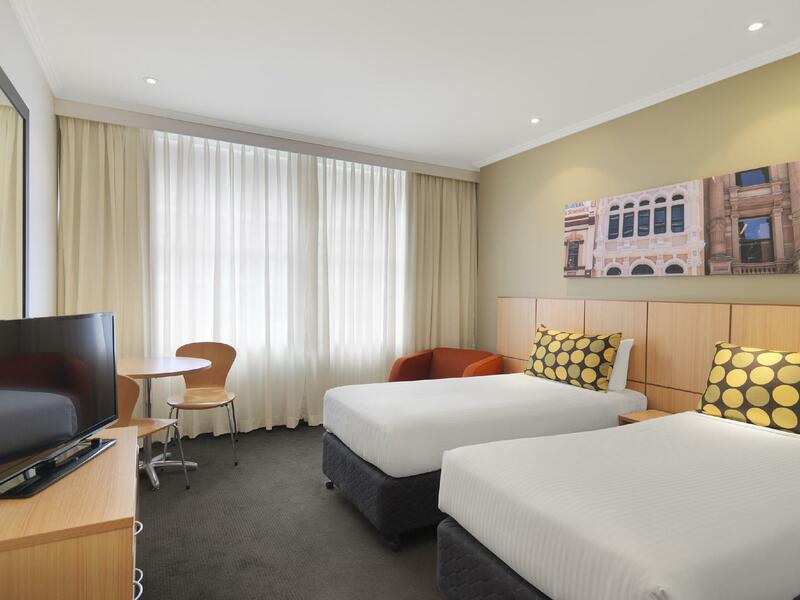 This hotel is well placed within easy walking distance of a number of the Sydney sights/attractions. We took the train frkm the station and the hotel is a stones throw away from St James station. The hotel itself has minimal facilities ie no bar or restaurant but there are plenty of places nearby. The room are equipped with a mini kitchen area comprising of microwave,kettle ,fridge etc which is fine for making small meals. Perfect location to shops restaurants and train station. Exceptional Location. Walking distance to Hyde Park, St. Mary’s Cathedral, and Pitt St.-Martin Place shopping area. One bus ride going to bondi beach, one train ride to sydney harbor. Both bus and train stations (st. James and Martin place st.) are 3-min walk from hotel. Staff are very accommodating. Very good wifi connection. Great location for the price. A shame they don't have knowledge or info on local areas to eat etc as the place we were told about had closed 9 months earlier! Hard to review as the entire building was under major renovation. It did not bother us as we were out sightseeing all day and only there to sleep. For the price it was excellent value and the room was fine. The hotel did warn about the renovations so we knew in advance. So all good! Spent one night here to attend a conference at the Government house so for that it was fine. However, the hotel was quite basic. and there was so much construction going on at the time, I couldn't sleep (during the day that is) due to the noise but perhaps that is over now. Overall, it did the job. The staff weren't too helpful or friendly though when I mentioned to them I had left an item in my room after check out. They looked at me as if I were an inconvenience to them and seemed to do very little to help me find it. - said they 'checked it out' and couldn't find it when I was sure it was there. Oh well. The hotel is currently being renovated so it's not putting its best foot forward. The room was spacious and quiet and apart from the temporary entrance being difficult with baggage, it was OK. Should be much better when the renovations are complete. There were some let downs - namely the 100mb Wifi which is rather tragic, lack of a handheld shower and you have to pay $20 per entry to the gym; so technically there is no gym in the hotel and Agoda should get that rectified. A 4 star hotel without a pool and amenities like a gym and a decent cafe is much of a joke. 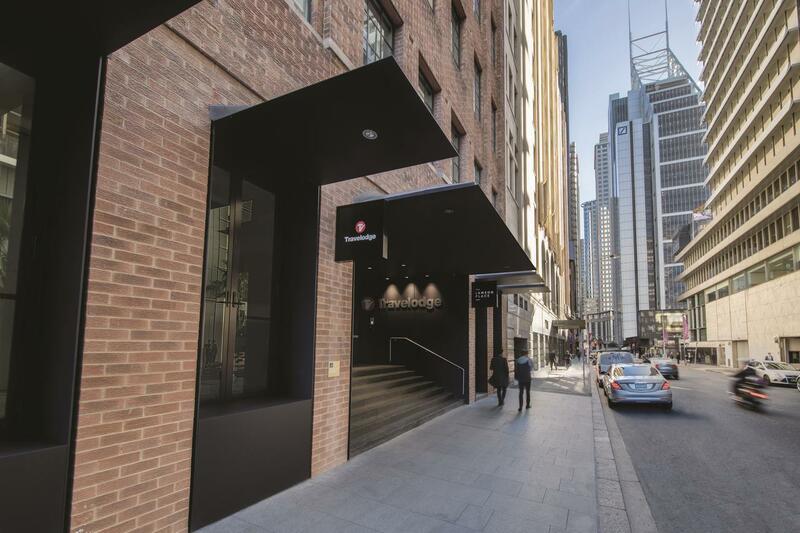 But the location is great: it costs $55 for Airport transfer (by the hotel), 30 secs from the Martin place train station (and the Lindt cafe where the Sydney Siege happened). The cafe opposite the hotel (Silks) serves wonderful breakfast, and the Martin place shopping circle nearby offers many choices for breakfast and coffee. The room and hotel is simple and old school (by Singapore standards), but is clean, simple and intelligible. Comfortable and cosy indeed. It comes with a fridge, microwave, washing sink, full set of cutlery and utensils, and hairdryer, iron/ironing board. Sadly, small bottles of shampoo & shower foam, and no toothbrush nor slippers. Central location, cheap compared to others, nice bed. 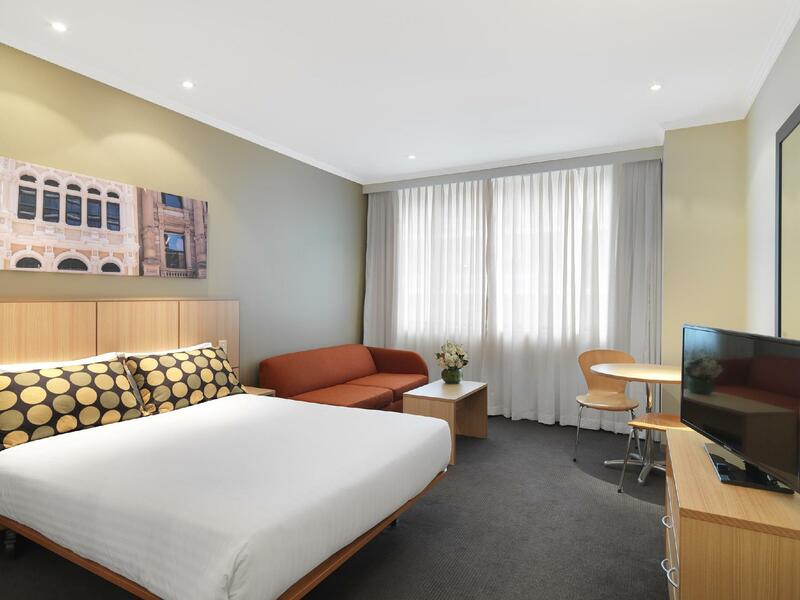 We stayed here for the location, it was great for shopping and exploring Sydney CBD. It was cheaper than other places but no where near as fancy as those other places (you get what you pay for). Bathroom needed a little work, but the bed was nice and big for such a small room. The air con was a little noisy, could not here ant noise from other rooms considering they were fully booked was amazing.Location in business part of city which on a weekend was very quiet in the surrounding streets. Comfortable stay.